Mumbai is the world's largest open-air kitchen. Street vendors, selling everything from pineapples to pigs' trotters, cater to the appetites of eighteen million people, many of whom have migrated to this metropolis from different corners of the sub-continent. Much of the food offered by these sidewalk hawkers is fresh and delicious, but it requires intestinal fortitude-in both the literal and metaphorical sense-to brave the dust, the flies and slap-dash standards of hygiene that exist on the streets. Well, not to worry. For the less intrepid, Mumbai offers an array of inexpensive eateries that permit visitors to sample local cuisine without putting their cholera and typhoid shots to the test. Situated in the south end of Bombay's claw-shaped peninsula, Colaba Causeway is at the heart of tourist activity. 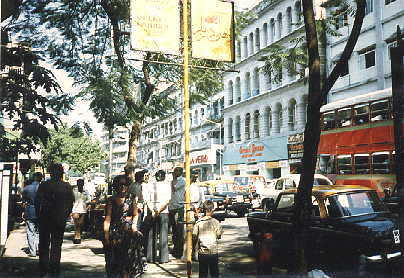 The street is lined with shops selling bolts of material, ready made garments, provisions and hardware. Sidewalk hawkers bawl their wares (plastic toys, cheap jewelry and an assortment of bric-a-brac) above a confusion of beeping horns and wheezing buses. This popular restaurant is utilitarian but clean. Kailash's selection of syrup-laden Indian sweets-rusogolas, gulab-jamuns or fudge-like kadju(cashew) barfi-is superlative. Their menu includes an assortment of Sindhi snacks such as Sindhi Pakodas (chopped spiced vegetables covered by a chickpea batter and deep fried), as well as batata vadas and pani-puri. They are also the best choice for a Mumbai specialty: bhel puri. If anything can be said to typify Mumbai's chaotic population mix, it is bhel-puri: a mirchi-masala combination of puffed rice, finely chopped onions and green chilies, tiny diced potatoes and sev - crisp curly noodles made out of chick-pea flour. The whole lot is mixed in with a date-and-tamarind chutney and garnished with chopped green coriander leaves. Bhel puri is eaten with deep-fried wheat-flour puris, crunchy discs the size of a pound coin. Bhel puri deserves a further footnote. It reputedly originated in Gujerat and was introduced to Mumbai by Vithal Khadawala over a century ago. 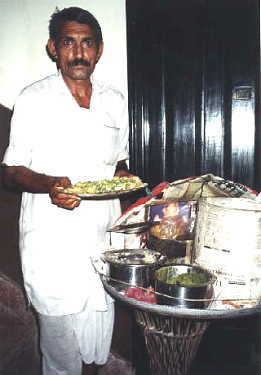 His descendents now run Vithal Bhelwala restaurant in the shadow of the gothic turrets of Mumbai's Victoria Terminus Railway Station (renamed Chhatrapati Shivaji Terminus). Mumbai-ites congregate here in large numbers, (or drop into Yoyo's, a vegetarian pub next door, also run by the Khadawala family). However, my vote for bhel-puri excellence still goes to Kailash Parbat. This is such a tiny hole-in-the-wall, that it is easily overlooked. It is situated just north of Khushru Baug, a landmark Parsi colony on Colaba Causeway. The eatery's only claim to fame is a piquant mutton - or chicken - curry rolled into a flour-and-egg flaky paratha (fried flat-bread). Known as "Frankie Rolls" the recipe for these take-out wraps is a closely guarded secret. Not so secret is its reputation among Mumbai-ites who come by all day in a steady stream. Twenty years ago, Café Modegar served up an excellent variety of cheap Indian dishes, albeit in shabby surroundings Today the place has been spiffed up with wall murals by Mumbai's leading cartoonist, Mario Miranda, and has designer menus with prices to match. It is a popular hangout for foreign backpackers. This humble sidewalk cart is located in a seedy lane behind the Taj Mahal hotel, an area notorious for drug-dealers and pimps. This doesn't deter customers in the least. Bade Miyan has earned legendary status for his egg parathas and charcoal broiled, onion smothered kheeri-kaleji (udder and liver), Mumbai's answer to a filet mignon steak. By the time the stall opens around 7 o'clock in the evening, there is already a line up of people and sometimes a limousine or two parked along the curb. 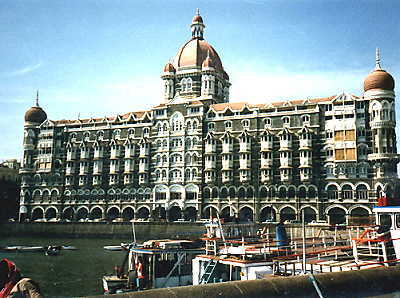 The Taj Mahal Hotel, India's equivalent of Raffles in Singapore, is located off the main Causeway, and overlooks the harbour and Gateway of India. If you are prepared to splurge, the Tanjore, with its opulent décor and subdued lighting, makes for a memorable dining experience. Patrons listen to Indian classical music and watch traditional dance performances while enjoying a range of Moghlai dishes: Tandoori chicken marinated and baked in a clay oven to a buttery succulence, pilaf prinkled with slivered almonds, and a variety of flat breads from deep-fried Kulchas to tandoori rotis. Dress elegantly. Note: Four other long-established restaurants in the mid-to-expensive price range which specialize in Moghlai cuisine are Khyber Restaurant (Kala Ghoda), Gaylords (Veer Nariman Road, Churchgate), The Copper Chimney(Annie Besant Road, Worli) and The Mumbai Brasserie (Annie Besant Road, Worli).